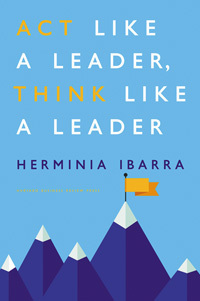 Herminia Ibarra’s "Act Like a Leader, Think Like a Leader" provides us with innovative and instructional ways to develop as stronger leaders of our banks in this transformational age. As a student of leadership, Herminia Ibarra’s Act Like a Leader, Think Like a Leader is as innovative as any book I have seen on the subject. While thousands of books have been written about leadership, few throw the reader so sharply out of their comfort zone. Herminia Ibarra, Act Like a Leader, Think Like a Leader. The first surprise is Ibarra’s “outsight” principle, which holds that the “only way to think like a leader is to first act.” She continues with the thought that “introspection should follow action and experimentation—not vice-versa.” Talk about innovation! To harness the outsight principle, she says, you must redefine your job, your network and yourself. The first outsight principle, redefining your job, warns that success can create competency traps. Repeatedly doing the same thing can blind you to what else may be possible and what new skills you might learn. Instead of always asking what you can do better, the better question could be: What should I be doing instead? To move us from the comfort zone of incremental progress, Ibarra suggests four steps. The first is to become the bridge between the team and the external environment. Regular contact with the outside will allow a better understanding of the entire organization and the external factors which impact it. This enables the second step: envision new possibilities and all that is needed in “developing and articulating an aspiration.” The third critical step is to engage people in the vision and the attendant change. It is more than placards and posters, Ibarra writes. It is engagement and, just as importantly, embodiment of the change by you, the leader. This fourth step, embodiment, allows others to understand the vision channeled through you. One of the attractive features of Act Like a Leader, Think Like a Leader is the abundance of practical suggestions and worksheets. Ibarra provides a checklist of additional suggestions to round out the process of redefining the job through sensory development, engagement in projects outside customary areas and participation in activities outside of the job. The second outsight principle calls for networking, across the organization and outside of it. Ibarra tells us that we are narcissistic and lazy in our networks, tending to seek out those like ourselves, who also happen to be close by. The book provides a remedy for this with step-by-step guidance on how to develop generational, personal and strategic networks. The networks will function the best when they meet the “BCD test” for breadth (multiple layers of diversity), connectivity (enabling connections that otherwise would not occur) and dynamism (which allows relationship ties to strengthen over time). Ibarra includes many practical aids to help with this sometimes uncomfortable process. I found the third principle of “outsight” to be the most uncomfortable. It was the suggestion that we should be more playful with ourselves, experimenting with who we are, rather than just working on it. Ibarra challenges the notion of being “true to one’s self” by suggesting that this could actually be holding you back. Ibarra’s advice can push you from your comfort zones without letting you become a fake—but it’s a closer line than you might imagine. We all know that banking is in a constant state of change. Success will belong to those who innovate. Act Like a Leader, Think Like a Leader provides us with innovative and instructional ways to develop as stronger leaders of our banks in this transformational age. William B. Grant is chairman and CEO of First United Bank & Trust, Oakland, Md.